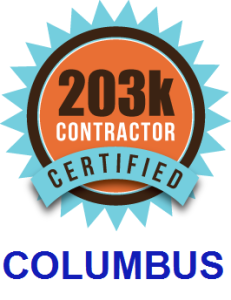 Proud to be listed as a Certified 203k Contractor in Columbus, Great Roofing and Restoration is always prepared to tackle the processes involved in an FHA 203k home loan remodel. Remember, we’re more than a roofer. We can handle anything from exterior to interior work. Roofing, drywall, paint, flooring, kitchens and baths, you name it! Throughout the 203k process many steps are involved for both the homeowner and their 203k contractor. From permits to inspections, draws to final invoicing, our knowledge of the 203k home loan process will assist you in getting your new home (or current) rehabbed to your liking. Currently Columbus is a booming real estate city, with many opportunities to invest in a new home. From Old Town East to Grandview and many of the other historical districts, older homes are being rejuvenated all around the city. How a 203k loan can help is by providing the funds to fix up a home you want to invest in, without taking money right out of your pocket. The process is pretty simple. Let’s say you want to buy a $200,000 home, and want $30,000 in remodeling done to it. This would qualify for a Streamline 203k loan (assuming no structural changes). The bank would then allow for a disbursement of half the funds up front. This will allow us to pay our labor bills, while the material is paid for using our accounts. Once the work is complete the mortgage company would do an inspection and the final total amounts would be released. Your $200,000 home, now with $30,000 in remodeling, is now a $230,000 mortgage. 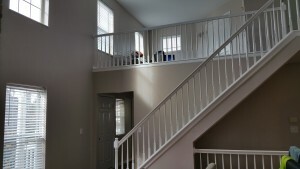 Most remodels of this kind raise the value of the home beyond the $30,000 investment, which is instant equity for you! The best part is that even if you already own your home the FHA 203k rehab loan is a great opportunity for refinancing! You can refinance, hire a 203k contractor in Columbus, and then have a full remodel done on your home. Ability to purchase properties that may not meet FHA standards and complete the repairs/improvements AFTER the home is purchased. When offer is presented properly to seller, 203k offers may be advantageous in a competing offer situation as the seller does not have to fix-up or repair the property but instead allow the buyer to include these items into their 203k mortgage and complete the improvements after closing using the buyer’s own style and design. Finding a 203k lender in Columbus is easy. Just access this HUD guideline. Also a list of lenders from the 203kContractor.com website is available for the state of Ohio. So you may be asking, which 203k loan is right for your remodel? Whether streamline or full, we are equipped to help you through the entire 203k process. The FHA 203k Standard/Full allows for structural modifications, additions, landscaping, and architect and engineer contracting, and requires the use of a HUD approved 203k Consultant. The remodeling cost for the Standard/Full 203k version is minimum $5,000 and the maximum is the FHA mortgage limit for the area in which the property is located (up to $1.4Million – some restrictions apply). Click Here to access the maximum FHA mortgage limits for all areas. The Streamline 203k version, on the other hand, will not allow for structural modifications, landscaping, etc., and remodeling changes have no minimum amount but have a maximum limit of $35,000 (some restrictions apply). Looking for a Realtor who is familiar with the 203k or other rehab loan process? Check below!